Home » Consignment Boats Wanted! HANK’S SELLS BOATS ON CONSIGNMENT. WE NEED CONSIGNMENT BOATS OF ALL KINDS, ESPECIALLY RUNABOUTS AND PONTOONS. WE HAVE BUYERS, JUST NEED THE BOATS! THE BOATS ARE LISTED ON VARIOUS WEBSITES AND GET A GREAT DEAL OF EXPOSURE! THE RATES VARY ACCORDING TO THE DOLLAR AMOUNT OF THE BOAT. THE SELLER SETS THE PRICE AND GETS THE RIGHT OF REFUSAL ON ALL OFFERS. CONSIGNMENT BOATS ARE SOLD AS IS NO WARRANTY. 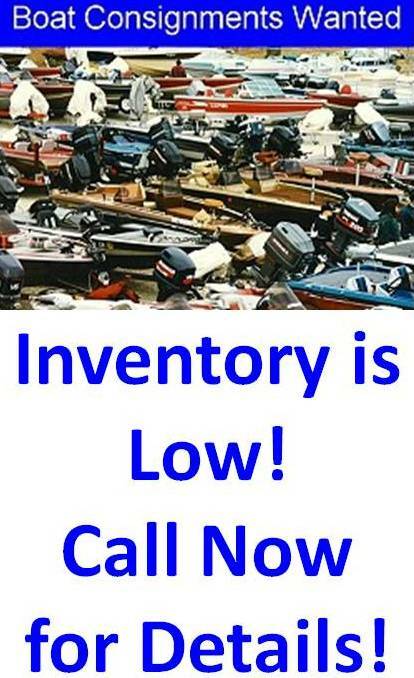 JUST CALL 217-229-3012 AND ASK FOR TRICHA TO GET YOUR BOAT SOLD!